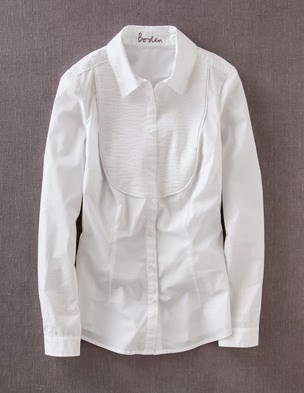 Item two is a basic white shirt. Not very dressed down I hear you say but a wardrobe basic that I'm lacking and one that I know will give new life to a few jumpers and sleeveless dresses. but sadly, I didn't notice that it was double cuffed. 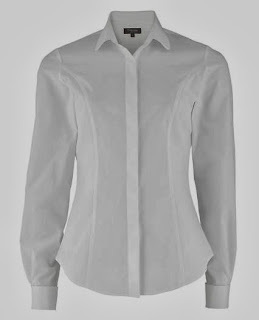 It was a lovely shirt but I didn't even try it on as I can't bear double cuffs for casual wear. Thank goodness for free returns! 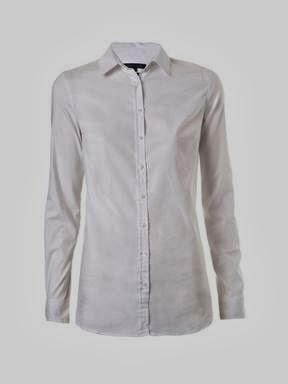 TM Lewin do have a buttoned cuff version on this link but it was out of stock in my size. So the hunt continued. This one from Boden looks great - but on closer inspection, it seems a bit flimsy on the collar. I'm really looking for something with a more substantial collar. This one from the new spring collection has a collar more along the lines of what I'm looking for though I'm not overly keen on the bib detail and it is full price! And then - the exact style I was looking for, also in House of Fraser but not in the sale! I waited for it to arrive before blogging so I could be sure it was the one and I'm delighted with it. Exactly what I wanted. 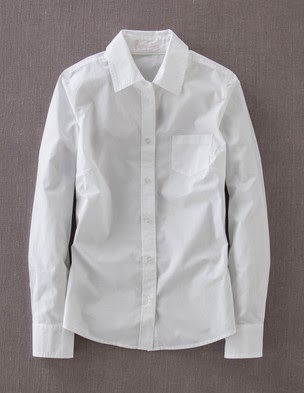 Lovely bright white, not see through, great stretch in it, nice firm collar, long enough sleeves and not too long to wear alone but not too short that it gapes on my long torso. In fact, I would almost consider buying two of them. Here I am wearing it - mine is a size 12 and I would say it's a bit generous..I could have got away with the 10 but for more casual dressing, I prefer a bit more material. Really really pleased with this one - that's item two in the bag! Finishing with what I wore yesterday (today is coming on another post).. It was a working from home day, sorting out receipts, invoices and stock for the shop so I wore my Cosy Slippers (further reduced to £11.60! ), Crew Neck and Knitted Jacket (old) all from Boden! Ok - for all you bloggers out there - please add your January Sale posts below using the linky and do please click through to read some of the other posts! That shirt looks perfect - well done you. Excellent find. Mine are definitely more oversized than that - you wouldn't get a man's shirt to fit like that at all. Love those jeans - I have been salivating over the Gap ones.... Will they make the grade?! 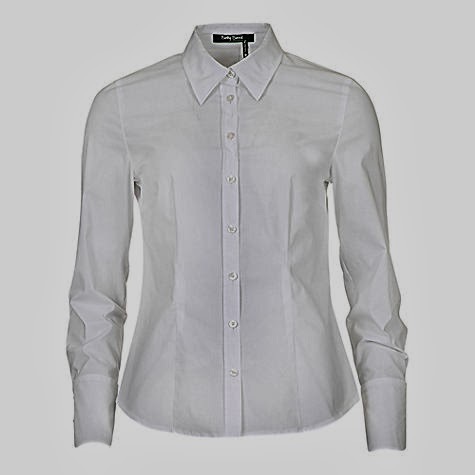 Looks really good, can't beat the classic white shirt for looking effortless and stylish all at the same time. Added my sales post again. Well I have had a thing for my shirts for years - was a hard one to shake off when I stopped working but I always kept my white ones tho they always need replaced every couple of years. Baffled at how tricky it is to find a nice one and at how expensive they are when compared to men's ones! What a find! I have a friend who used to swear by Betty Barclay for work shirts .. I could never bring myself to look at them (connotations of mother and MIL as well!) but you've convinced me of the error of my ways! You made the best choice Avril. Love it. Those slipper boots are a bit of a bargain aren't they. I am always slightly nervy around white since having kids...bolognese...hands....shirt! But you have convinced me I certainly need one in my life that BB shirt looks fab on you! It is a wardrobe staple Avril and one I find the hardest to get right! I think BB is on sale in Pamela Scotts at my local Whitewater shopping mall! I must check it out as yours looks fab:) Linking up some leopard boots I found at M&S,They are now a bargain if any of your readers take a size 5!